Well, I like her style, too, but noone is always perfect. How can you be sure that you have cleaned all the corners of this tub? Yes, it is definitely very interesting as an idea, but still, it is too cold and unwelcoming. also, i completely acknowledge what you are saying. contemporary design can frequently be cold. i think the wood accents warm it up a bit. 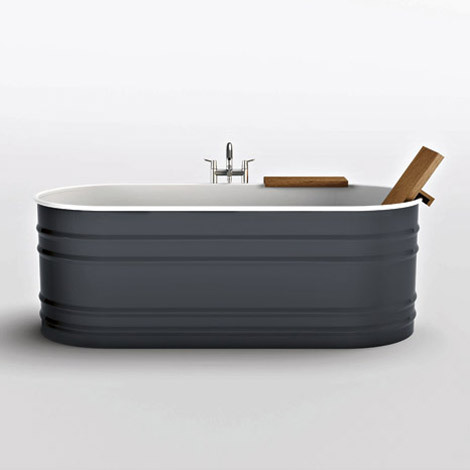 i also picture this tub in a high beamed/ceilinged room paneled in wood, with maybe some antiqued hardware and fluffy towels in sunny tones, which also warms it up in my mind. Well, for me it resembles a sardine tin! Doesn’t meen it wouldn’t be big enough or kind of beautiful but it doesn’t look so comfortable. ahahahaha! that is hilarious and i totally see what you are saying – it isn’t contoured at all except for that teak backrest. 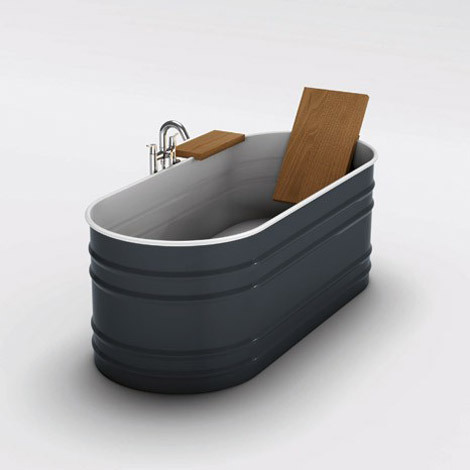 i am so used to the idea of an acrylic or porcelain tub which is part of the reason why this one intrigues me so much.